"When we looked at 3G, the chipsets are not quite mature, in the sense that they're not low-enough power for what we were looking for. They were not integrated enough, so they took up too much physical space. We cared a lot about battery life and we cared a lot about physical size. Down the road, I'm sure some of those tradeoffs will become more favorable towards 3G but as of now we think we made a pretty good doggone decision." The primary benefit of 3G support is obvious: faster data rates. 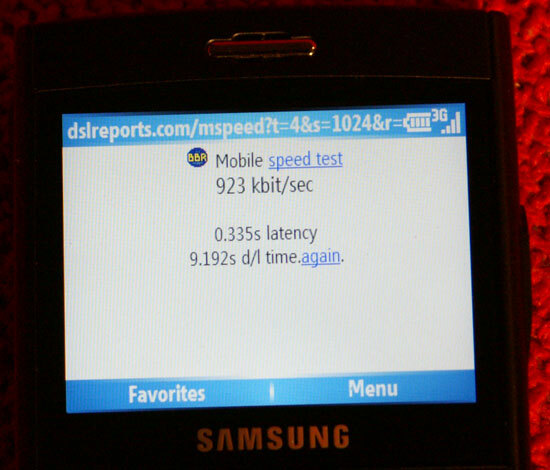 Using dslreports.com's mobile speed test, we were able to pull an average of 100kbps off of AT&T's EDGE network as compared to 1Mbps on its 3G UMTS/WCDMA network. Apple's stance is that the iPhone gives you a slower than 3G solution with EDGE, that doesn't consume a lot of power, and a faster than 3G solution with Wi-Fi when you're in range of a network. Our tests showed that on Wi-Fi, the iPhone was able to pull between 1 and 2Mbps, which is faster than what we got over UMTS but not tremendously faster. While we appreciate the iPhone's Wi-Fi support, the lightning quick iPhone interface makes those times that you're on EDGE feel even slower than on other phones. Admittedly it doesn't take too long to get used to, but we wanted to dig a little deeper and see what really kept 3G out of the iPhone. 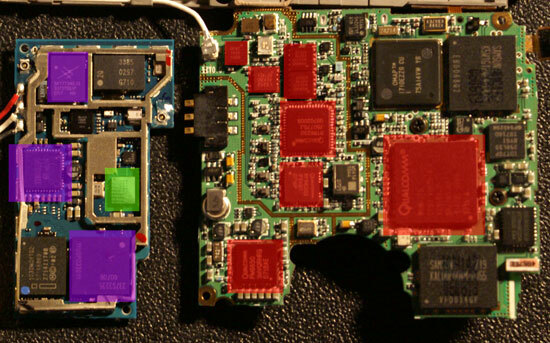 The largest chip on both motherboards contains the multimedia engine which houses the modem itself, GSM/EDGE in the case of the iPhone's motherboard (left) and GSM/EDGE/UMTS in the case of the Blackjack's motherboard (right). The two smaller chips on the iPhone appear to be the GSM transmitter/receiver and the GSM signal amplifier. 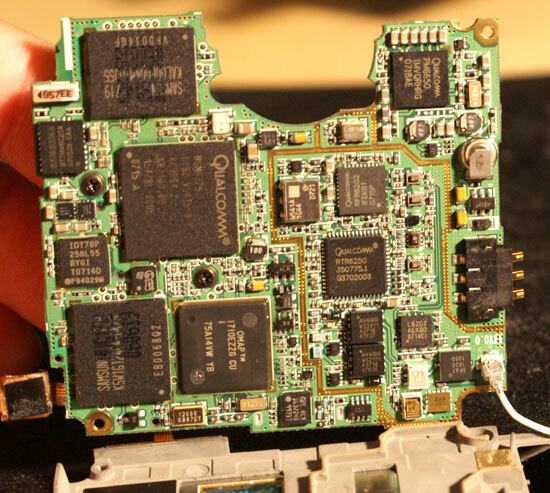 On the Blackjack, the chip in the lower left is a Qualcomm power management chip that works in conjunction with the larger multimedia engine we mentioned above. The two medium sized ICs in the middle appear to be the UMTS/EDGE transmitter/receivers, while the remaining chips are power amplifiers. The iPhone would have to be a bit thicker, wider or longer to accommodate the same 3G UMTS interface that Samsung used in its Blackjack. Instead, Apple went with Wi-Fi alongside GSM - the square in green shows the Marvell 802.11b/g WLAN controller needed to enable Wi-Fi. So the integration argument checks out, but what about the impact on battery life? In order to answer that question we looked at two smartphones - the Samsung Blackjack and Apple's iPhone. The Blackjack would be our 3G vs. EDGE testbed, while we'd look at the impact of Wi-Fi on power consumption using the iPhone. Well, explain that to me how was I talking with a friend and browsing DT at the same time with my nokia now ? Even the good old GPRS allows for simultanious data/voice scenario, that is actually one of the points of the packet-based technologies. If you have standard 4+2 GPRS/EDGE timeslots available you just have the bandwith during call reduced to 3+1 scenario as voice requires 1+1 slots for its operation. It's not a typo, you misunderstand the test. WiFi for voice would be very nice. They could even charge me the same minute fees/bucket. There are plenty of homes with very good wifi coverage but crappy wireless cell coverage... works almost like a signal booster. I'm pretty sure you guys are all wrong. The iPHone has just enough features so people will go out and buy it in rabid frenzy, while the next iteration (in probably 6 months) containing 3G, Thinner/Lighter, etc will push people like ME to buy it (The educated consumer, who really does know how backwards the innards of an iPhone actually is), plus everyone who bought the first generation will dump theirs for the much faster data transfers and buy a second gen iPhone. I wonder if the iphone youtube results are so good because the device buffers the video. It could be that you only download the file once, then play it back from cache. Could you maybe repeat the test with different clips every time to see if this is the case? Why would anyone, atleast outside the US mobile network, get an iPhone? Its 3-4 years behind atleast. Take a cheaper nokia n95. You get gps, video calls (DVD quality, 30fps), TV, msn, 5Mpixel cam, MMS, 3Mbit internet, longer battery life and so on. On a 3.5G network for less than an iPhone.